My friend of nearly half a century, Joseph J. Challmes, died on Monday Feb. 9, of a heart attack as he was leaving a Stoop Storytelling show at Baltimore's Center Stage with his companion Margie Roswell. Today, his friends, family and extended family packed a chapel at a suburban funeral home for a nonreligious remembrance gathering. Joe had wanted his body cremated, and was not religious. As I have noted here in the past, one of the traditions of my native Jewish faith takes place at the burial, with an opportunity for each person to drop some earth into the grave -- a last gift, of an act the departed cannot do for himself or herself. Joe had no burial -- in fact, he wanted his ashes scattered at the finish line of the race track in Saratoga Springs, N.Y., his favorite thoroughbred venue. He was a gambler, a storyteller, and a man most people could not help but like or even love. Joe Challmes and I had a lot in common -- Baltimore boys who grew up, or not, at The Baltimore Sun -- neither having gone to journalism school. We were, however, working our way through college. I started there as a wireroom clerk and won a promotion to editorial assistant and reporter, but Joe outdid me in that respect. He relished telling how he was probably the only person who was promoted to the job of copyboy. In the days of newsroom typewriters, reporters would pound out stories on three-copy carbon sets, a few paragraphs at a time. We called each page a "take" and when it was ready to send to the city editors, you'd strip out the carbon paper, hold up two of the sheets in a haze of tobacco smoke and holler out, "Copy over!" And one of the half dozen or more copyboys, or girls, would scurry over and grab them. Predictably, the neighborhood association was not very happy, and held an emergency meeting with a demand for an explanation from the newspaper. Joe was off, maybe on vacation, and I was sent to appease them. Among other defensive moves, I tried to explain that Joe was not actually a reporter. I did not mention that his story was spot-on. I was, after all, a goodwill ambassador that night. McCabe Avenue did not get better over time, alas -- nor has the world we inhabited with great relish as 20-somethings. Murders, carjackings, drug epidemics, fatal accidents, devastating fires, racial hatred. We were voyeurs of human misery, misunderstanding and, the most fun, social darwinism. Joe and I worked side-by-side on the rewrite end of the city desk, taking notes from other reporters and turning them into fodder and, on a really good day, front-page eye-poppers for the newspaper. You can find hundreds of Joe's subsequent bylined stories in a quick search of the online Sun newspaper archive through area public library systems -- with headlines like "Society figure's death leaves police baffled," "Maryland Training School: Youth kept in leg irons," "Reputed psychic joined murder probe," and "Chase ends in ladies room: Baboon free for 3 hours after escape at airport." Joe was probably the fastest writer I've ever seen, but he cheated. I'm sure he used more than two fingers, and he would leave out words... like verbs. I'm sure the verbs were in his head as he wrote each sentence, but he was thinking even faster than he could type. The Facebook responses to news of Joe's death give you an idea of how good he was on rewrite -- a senior reporting job that we occupied as two young crazies. 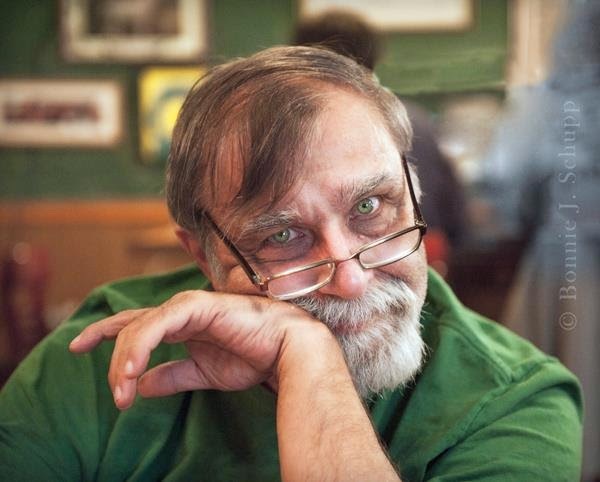 Tom Linthicum, who became a top Sun and Maryland Daily Record editor and teaches journalism, offered this: "He was on rewrite when I started as a police reporter at The Sun and no matter how much detail I gave him, he always sent me back for more. It was a great crash course in reporting." We learned journalism on the job. And while we were absorbed by the newspaper world, and late-night partying -- usually at the old Peabody Book Store and Beer Stube, whose owner Rose Pettus ushered us regularly into the tavern's back-basement speakeasy for after-hours drinking -- we were for various reasons slowly blowing up our first marriages after helping produce a few amazing children. Casualties of our own immaturity, I guess. Joe also had another mistress, besides our newspaper and carousing -- the ponies. He was consumed by a fascination for horse racing, and after a command performance of his handicapping prowess for a betting audience of his newspaper bosses, talked his way into a daily sports column under the nom-de-plume The Fashionable Fraud. He had a pretend thousand-dollar pot for wagering in print, and managed to blow it all before very long. But they gave him more pretend money to play with. Joe was not bad at handicapping, He was very good. And hopefully you have by now heard the recordings of his Stoop Storytelling appearances -- the first one, in 2009, about his amazing day at the Belmont when he turned a borrowed $40 into enough cash to help buy a farm in Carroll County with his then-wife Sharon, and breed their own thoroughbred race horses. The fascination with racing also lured Joe away from his, pardon the expression, stable job at The Sun. Somehow he ended up writing and handicapping for a business offshoot of the owner of the Psychic Friends Network. Later, operating his own mail-order tip business, he took on a new nom-de-plume -- The Colonel. That's Kentuckyese for a successful gentleman with a fondness for alcohol who knows his way down the backstretch. He marketed a service in which bettors paid in advance for the Colonel's favorite picks and, of course, the "lock of the week." And a really great bet was called "a mortal lock." He had no shortage of them. Joe's path took him to New York, marketing and writing for a group of betting-oriented sports newspapers, and he expanded his writing work as a freelancer. None of this is easy. Joe worked hard to get by. Alas, horse racing -- like his poker playing -- did not make him a rich man, but losing in memorable fashion made for great storytelling. I was equally consumed by my newspaper work, so over the years our contact became more sporadic. There was a visit to another farm in Pennsylvania, where Joe and another life partner, Cheri Moats, had some kids and a herd of horses before splitting up. I saw a Facebook post by Cheri yesterday, recalling how Joe -- in his first stroll outside their house after quadruple-bypass surgery -- found one of their horses foaling with great difficulty in the pasture and managed to save both equine lives. A few years ago, Joe and I began seeing each other more regularly. With a few other friends, I helped Joe move out of his huge but strange apartment beneath a strip mall in Hanover, Pa. Strange is having an underground lair that includes a judge's bench and a prisoner holding cell. And that's part of another tale you can hear online, at both the Stoop Storytelling and SpeakEasyDC Web sites -- how Joe ended up overseeing a way station there rescuing trouble-beset teens. You can find posts this week on the Joseph Challmes Facebook page by a few of them, giving testimony and thanks at how Joe had helped turn their lives around. Joe was planning to move to Charlestown, W. Va., near a favorite race track, but fate intervened. He was having problems with one of his legs -- and his foot was cold. I took him to his doctor there before we headed off with a U-haul truckload of his possessions, and the doctor told him to go to a hospital emergency room -- if not in Hanover, then in Baltimore. It took a few weeks before the medical folks figured out the problem, and Joe lost the leg. Talk about a fall from grace -- he was homeless, really, and pretty much broke. He wasn't even legally a resident of Maryland, and without insurance or state Medicaid to cover the costs of rehab in a nursing home, the hospital was ready to send him out into the world with one leg and a wheelchair. Still, sitting in his hospital bed, Joe called himself the happiest one-legged man you'll ever meet. I would not want to get into the politics of healthcare and insurance. Rather, I speak to the goodness of people -- in particular Margie, who came to Joe's rescue. And, it seems, she also had fallen under the spell of a crazy storyteller with a booming laugh and a twinkle in his eyes, and a heart that may have failed but was truly made of gold. I was very touched by a lengthy Facebook remembrance by our long-ago newspaper colleague Patricia Rouzer, who concluded: "Rest in peace, my friend. May we someday meet again, railbirds at the Saratoga finish line, basking in the warm summer sun, clutching fists full of only win tickets." From July 25, 2013, in a smaller venue featuring short tales, under the theme of "Scars"
February 11, 2014 - Appearance at SpeakEasyDC's program, on the same tale as his 2011 Stoop tale on rescuing troubled teens.